Ed has always had a great passion for flying - he started his career at South Warwickshire Flying School in 1997 on a RAF Flying Scholarship, followed immediately by his PPL whilst he was still at school. In 1998 he joined Air Atlantique at Coventry as an aircraft cleaner & re-fueller and self sponsored his Commercial Pilots Licence and Flying Instructor Rating. He began instructing RAF Scholarship and PPL students in 2000. Following completion of his Instrument Rating later that year he went back to work for Air Atlantique flying a Britten-Norman Islander on behalf of HM Coastguard in search and rescue operations, before thransferring for the Atlantic Express arm of the business on the Cessna F406 and various other multi-engine aircraft. Ed joined Britannnia Airways (now TUI Airways) in 2003 on the Boeing 757 & 767 and has since moved onto the Boeing 737 becoming a Line Training Captain in 2008. His current role is as a Boeing 737 Type Rating Instructor and Examiner for the Airline as well as being involved in their recruitment programme. 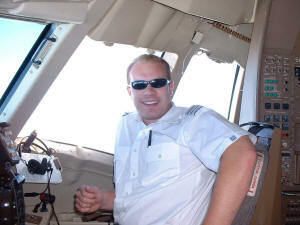 He has been a Flight Examiner since July 2011. In his spare time he enjoys aerobatics, snowboarding, cycling and teaching people to fly!